Starlet Star in ORANGE is BELLO!! My Starlet Star is in this beautiful Treasury! Thank you mirelloom. Click and comment please and we shall see if this great T gets to the Front Page! Wow My first Etsy Sale! Excuse my excitement but I have just had my first Etsy sale! ……So happy! Thank you very much my dear first customer! 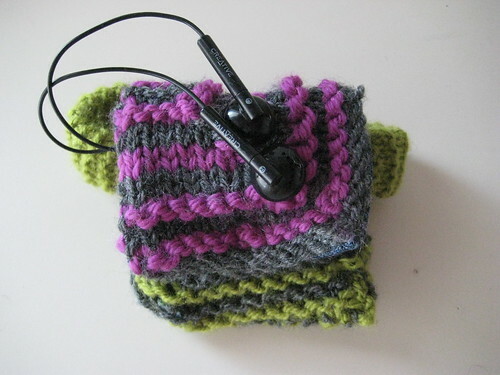 Psychedelic i-Pod Armband will be your jogging companion very soon! I will go to the post office on Tuesday and after its Italy-USA journey will reach your home nice and safe! In occasion of the “Knit A Poem” initiative I have dedicated a Treasury to Poetry…beacuse you always need poetry in life! Click and commnet…this is the link! Next month and exactly from the 16 to the 18th Ocober I will be (together with a couple a knitting friends) @ the Hobby Show in Milan. We have been invited by the fancy yarn producer Effe-Elle and we are going to teach in a few class. Paint with knitting – Learn how to paint using your knitting needles. Duration: 1 hour and 30 minutesMaximum 10 participants. Contact me if you would like to join the class. 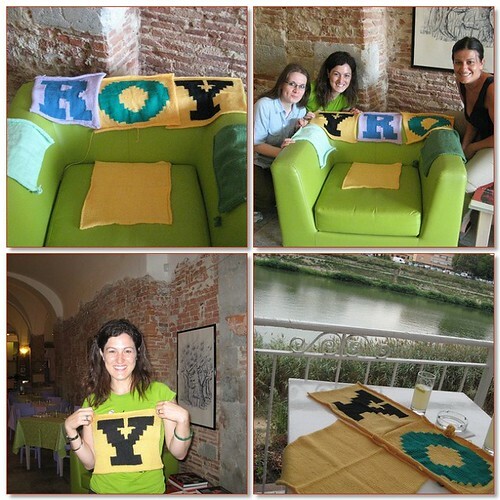 It is the 3rd September and the Knittable’ s knitters (that is the members of the Knit Cafè in Pisa) have completed their letters for the Knit A Poem! There has been a lot of enthusiasm for the initiative in the group. “Have you already contacted Rebecka? Have you received your letter? Which colours are you using?….and on and on until today when we got all the letters ready for the delivery! After all this time thinking about R-O-R-Y we did not wnat to depart from our coloured capitals without having a few memories of them! ….That is why we had this great shooting! Invite your friends for a drink or an elegant five o’clock tea and place the Lavender Gift Coaster beneath their cups to cheer up the table. 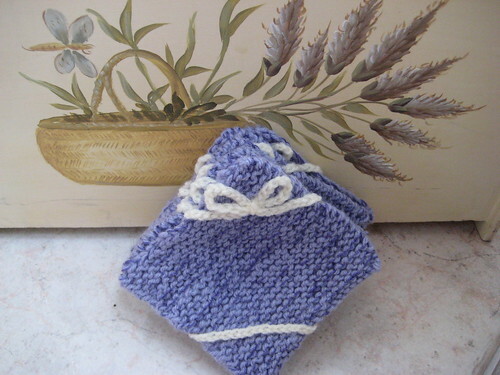 The Lavender Gist Coaster are knitted in garter stitch in a lavender acrylic and cotton yarn. Perfect for an easy wash. Wrapped around the square gift box there is a white crochet chain with bow in the corner…..exactly like a nice gift wrap. They measure 10 cm 10 cm ( 4 in.x 4 in.) and they are sold in groups of 6 for a 6 people serving. Today on Handmade Giveaway EfiaFair features her beautyful, fantastic, classy, original and very very romantic Ballerina Brooch. Don’t miss the opportunity to win the gorgeous Brooch in the colours and grace of an elegant ballerina. Visit Handmade Giveaways’ blog and follow all the instructions and you might be lucky enough to have EfiaFair’s Ballerina Brooch directly sent to your home ready to wear for a romantic autumn night!